Supports all the editions of Exchange (2016 & other previous versions) and Windows OS (Win 10 and all other previous editions). Software recovers mailboxes from corrupted or offline as well as online Exchange database. Tool has also the capability to recover deleted emails or other data from EDB Files. User can recover data like e-mails, contacts, calendars, notes, tasks etc. from Exchange Database. Exchange Recovery Software has one extraordinary feature that gives the option of Advance Scanning of deeply or highly corrupted data. User can go for the advance search in the case of heavy corruption but if the data is minutely corrupted, they can go for speedy recovery by Quick Scan option. 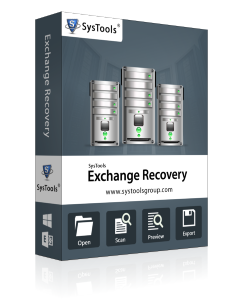 The tool help to recover and preview all Exchange Server mailboxes prior to converting in provided file formats. Each detail of the Exchange server mailboxes including emails, contacts, calendars, journals and to do lists can be previewed before saving in system. The tool is an advance solution that helps to restore EDB items from even when Exchange Server is facing downtime issues or in inactive mode. This allows them to recover and save Exchange Server items without relying on Server platform. Exchange EDB Recovery Software is equipped with auto-locate EDB file option from local drive that ultimately help to save ample of time of users that might be taken in manually browsing EDB files from system with tool. The tool is developed technically allowing users to export selective data from Exchange mailboxes into provided file formats. Users are required to browse the date range with tool and resolutely the tool will only export provided date ranged data in desired format. While recovering the data, software retains all the attachments attached with the e-mails. Attachments like document file, image, meta data etc., all remain attached within the emails after recovery. Also the attachments with the HTML body remain fixed with the mails. Exchange Mailbox Recovery Tool has the option to save the emails of EDB files in EML or MSG file format. These formats can further be used in any other applications such as Outlook Express, Windows Live Mail etc. as these formats are easy to import & supported by various email clients. Pub1.edb & Priv1.edb files, both are recovered by Exchange Recovery Software. Without any hamper or any data loss, tool easily repair & restore pub & priv file from Exchange EDB database. There is no restriction on the size of the EDB files and the tool can repair and restore EDB files in tera byte size. User can recover unlimited emails from this Exchange EDB Recovery Software. The free Demo Version of Exchange Recovery Software is available for the users to judge the capability of the Software. With the demo edition, user can recover the files from Exchange Mailboxes. Demo Limitation: The demo edition restricts the users from saving only 25 items/folder. One of the most fascinating feature of the tool that I've found was live Exchange migration. With the help of Exchange EDB Recovery Software, I recovered & migrated EDB of Exchange 2007 to 2010 without any hassle. Its speed & performance during recovery of large sized EDB file is far better than any other recovery tools. Also, it is very easy to use. Thanks Team!